For many Americans, edema - swelling caused by excessive fluids - is a major problem. 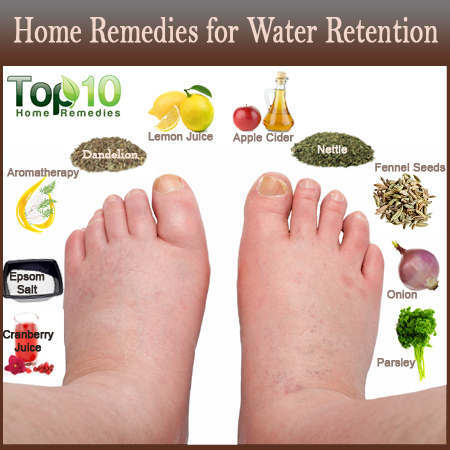 Fortunately, we're here with 10 easy home remedies that can help reduce water retention. Environmental factors that contribute to edema may include high weather temperatures, contraceptives, high altitudes, medications, eating too much salt, physical inactivity, and vitamin deficiency. Internal factors, such as stress, poor circulation, dehydration, pregnancy, allergies, thyroid diseases, high blood pressures, liver and vein disorders as well as heart and kidney problems, can also contribute. Check out these ten home remedies - each of which can help combat edema. Lemon Juice: A few tablespoons mixed with warm water (with honey added for taste) consumed a few times daily is a great fix. Epsom Salt: In addition to eliminating excess fluids and draining toxins, epsom salt baths can help you relax and calm troubled nerves. Simply add 2 cups of epsom salt to your bath and soak at least 15 minutes; repeat every other day. Apple Cider Vinegar: ACV helps resupply your body's potassium stores, helping balance out the sodium that contributes to fluid retention. Drink 1 tsp ACV (added to a glass of water) twice daily. Soaking your feet in a mix of warm water and ACV is also a good option. Fennel Seeds: 1 tsp fennel seeds boiled, then cooled 10 minutes makes a great tea; drink three times daily. Stinging Nettle Root: 1 tsp nettle root boiled in a cup of water, then cooled 10 minutes makes a tea that works well when consumed several times daily. Cranberry Juice: Because cranberry juice is a diuretic, it helps drain excess fluid while also building up mineral stores such as calcium, magnesium, and potassium. Drink 1 cup daily. Aromatherapy: Because aromatherapy stimulates the lymphatic system, it helps drain fluids. In particular, we recommend geranium, juniper, and cypress essential oils. Put 20 drops of each in your hot bath and soak yourself for 10 minutes, every second day. Onion: Boil a few peeled onions in 4 cups of water, salt for taste, then drink 3 cups of the resulting solution daily. Add more bananas, pineapples, cucumbers, watermelon, cabbage, celery, and watercress to your diet in addition, as this will help increase urine production. Also, it is very important to drink plenty of water during the day since dehydration can cause water retention, exercise regularly and limit the consumption of salt and alcohol. For many Americans, edema – swelling caused by excessive fluids – is a major problem. 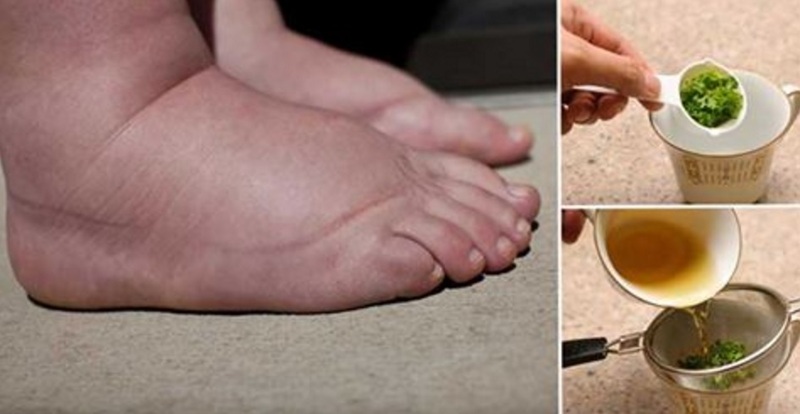 Fortunately, we’re here with 10 easy home remedies that can help reduce water retention. Check out these ten home remedies – each of which can help combat edema. Apple Cider Vinegar: ACV helps resupply your body’s potassium stores, helping balance out the sodium that contributes to fluid retention. Drink 1 tsp ACV (added to a glass of water) twice daily. Soaking your feet in a mix of warm water and ACV is also a good option.